The Polish town of Hajnowka is famous as the place of living of many Belarusians and a local centre of the Belarusian culture. 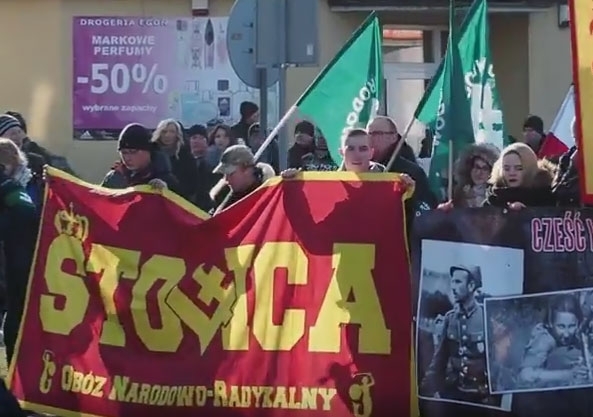 Yet a recent demonstration of the Polish nationalists dedicated to the memory of Romuald Rice became a threat to a fragile peace in the community as the man honored by the demonstrators burnt 5 Belarusian villages after the World War II. Romuald “Boury” Rice was one of the members of the Polish underground organizations participating in the fighting with the new Socialist regime in Poland and with the influence of the Soviet Union. 70 years ago Rice together with his soldiers burnt 5 Orthodox Christian villages together with the people who lived in them. He also ordered to shoot 30 villagers who had been asked by the undergrounders to help them with transporting their weapon. Only those villagers who were the members of the Roman Catholic Church managed to avoid death. 70 years later the nationalists with Rice on their banner marched in the town where the descendants of his victims live. The young protesters don’t want to hide that Rice is their hero. They even use internet, in order to popularize his name. The nationalists believe that the name of Rice should be respected as he was fighting against the Belarusian Communists who, as the protesters believe, were going to divide Poland. The march in honor of Romuald Rice and so-called “damned soldiers” (the title used to name his associates) was planned to be ended in a Roman Catholic church. Yet in order to avoid a scandal the demonstrators were only given the permission to enter the church porch. The planned prayer in honor of the murderer didn’t take place. This entry was posted in Featured News, News by Orthodoxy Cognate PAGE. Bookmark the permalink.